The Mpressor has some unusual and very useful tricks up its sleeve. Like the old Eventide Omnipressor, it offers negative as well as positive ratio values. These have the effect of reversing the dynamic range of the input signal in such a way that peaks above the threshold are squashed so hard that they become quieter than the remainder of the signal. This makes for some neat special effects, especially when used in conjunction with external side‑chain inputs. A feature you're more likely to use on an everyday basis is the Gain Reduction Limiter. This allows you to set a maximum level of gain reduction that will apply regardless of threshold and ratio settings, and is really handy when you want to apply a sonically consistent level of compression to a very dynamic source. Flexibility is further enhanced by the Auto Fast mode, which makes the compressor react faster to steep transients, and the Anti‑Log release option, which changes the release curve depending on the degree of compression applied. Finally, the plug‑in Mpressor faithfully reproduces its parent's Niveau filter. This is an unusual form of equaliser where you specify a centre frequency and an amount by which the entire spectrum is 'tilted' around it. So, for example, if you set the centre frequency to 600Hz and set the amount dial to a positive value, the low‑mid and bass become progressively more attenuated, and the treble is emphasised. In practice, the Mpressor plug‑in is certainly versatile, with a characteristic sound that manages to be both classy and muscular. I sometimes missed having a true programme‑dependent release setting when aiming for transparent compression across a mix, and I was disappointed that it's not possible to switch the Niveau filter into the side‑chain, as this would be a fantastic means of controlling the way the compressor reacts to bass. Touted as "the ultimate virtual tonewheel organ”, Guido Scognamiglio's VB3 piqued my curiosity somewhat, given that independently produced Hammond clones have had, up to now, more in common with a Crumar Organizer than a Hammond. VB3 has all the usual features you'd expect to find on a Hammond: upper and lower manuals, pedalboard, an emulated rotary speaker, percussion, vibrato and chorus vibrato, overdrive, keyclick, spring reverb — you know the drill. What sets VB3 apart is the sound, and in particular, the overdrive and rotary effects. The overdrive gets much closer than most to sounding like a Leslie preamp: it doesn't fizz and crackle, it growls and purrs. The rotary effect also gets it right, having a lovely deep swirl with pleasingly realistic timbral and amplitude modulations at chorale speed, and that distinctive Leslie 'rattle' at tremolo speed. Additional parameters include acceleration times, mic distance, stereo spread, and ambience, providing a useful degree of control over the organ's 'environment'. The key-click simulation is especially rich in detail: the time it takes for the nine virtual 'key contacts' to close varies randomly around a selectable value, which itself can be modulated by velocity. 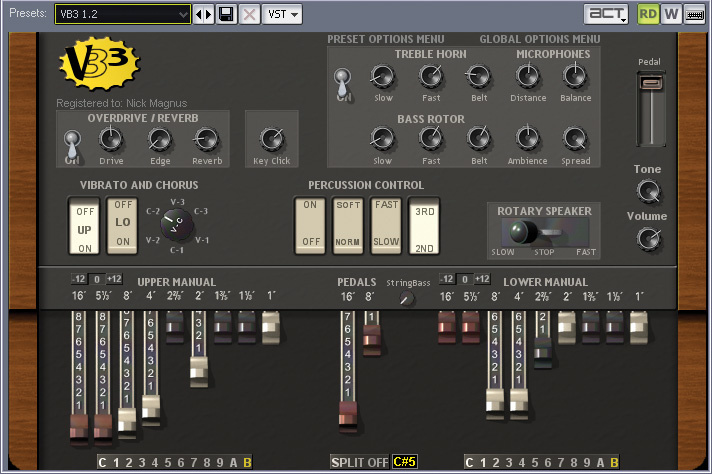 Each manual offers nine customisable preset registrations, plus Cancel (silence) and two 'freehand' drawbar settings. A bank of 32 factory programs is provided in addition to any you create and save yourself. VB3 also offers a host of customisation options, including MIDI channels for each manual and the pedalboard, optional 16' drawbar foldback, five rotary cabinet types plus a DI setting, tonewheel keyboard scaling, leakage level, rotary wind noise, and much more. There is a choice of three variations on the tonewheel organ model, as well as a choice of Hammond, Farfisa and Vox Continental waveform sets. 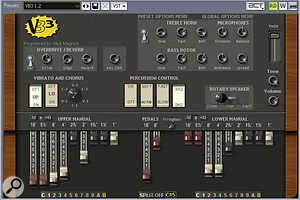 The choice of waveform set is stored along with presets, though certain customisations affecting the organ sound (such as rotary type and tonewheel scaling) are stored as global settings, rather than being integral to presets. Subsequently, they have to be reset manually for each occasion they're required. This is one of the few aspects of VB3 I'd change, given the opportunity, another being the inclusion of a bass-cut tone control. PSP's Old Timer is a very simple dynamics processor that offers smooth‑sounding, soft‑knee compression, with the option to switch in tube emulation. Copy protection is through a software key accessed by registering on‑line or via iLok, and time‑limited demos can be downloaded. The compression ratio goes from 1.2:1 to 10:1 in seven steps, and there are but three other knobs, labelled Time, Compression (threshold) and Output (level). Time takes the place of the usual attack and release controls: settings of between four and seven emulate typical opto or valve compressors, while higher values are more suitable for levelling. The lowest settings are the fastest and are well suited to drums and percussion. PSP say that the knee response resembles Dbx's 'over easy' characteristic for the 1.2:1 and 1.5:1 ratio settings, becoming a more conventional soft‑knee at higher ratios. The 'over easy' response features a continually steepening curve with level, so that there is no specific threshold point: all signals are compressed to some extent, and the higher their level, the more they are compressed. 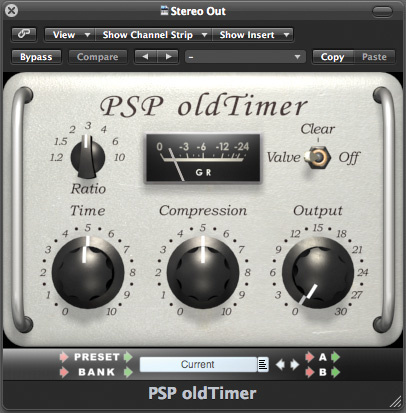 Selecting Valve mode brings in a soft‑limiting, level‑dependent tube emulation that sounds similar to the tube saturation in PSP's Vintage Warmer.